100 years ago today – Death Valley 134° record by the observer, why are there two different paper records? | Watts Up With That? Why would there be two different paper records for the same month, one with remarks filled in and the other not? There are other clear differences also. One wonders why two paper records would be needed. Perhaps one was created for “official presentation”. Both forms appear to have identical layouts, but are filled out differently. Stranger though, that while they have time for this fanfare, neither the NOAA/NWS nor the NPS representatives have time to answers these questions about the record, which I posed to them last week in this email below. Mr. Berc has since responded, but said he’d only answer my questions if I was present at the event, and when I replied that I would not be present, has offered no answers. Ms. Chipman has not replied. I’ll be covering this event. I have some important questions that I’d like to ask. 1. Do you have press passes available? 2. Why did NOAA decommission the MMTS electronic sensor near the front of the Visitor Center last year and go back to using the mercury thermometer in the Stevenson Screen? What was the impetus? Am I correct in noting that the MMTS thermometer was in use for over a decade prior to last year? 3. When was the last time the Stevenson Screen received maintenance for paint? When I was last there, the screen looked quite chipped/peeling and had some darkened wood from aging. Is it painted with latex paint or the traditional lime based whitewash paint which was the standard in 1913 for all USWB Stevenson Screens? 4. 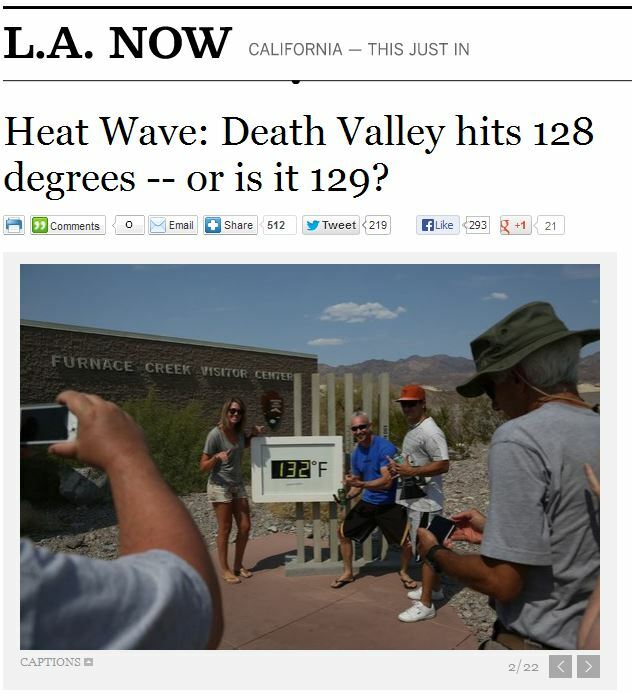 Why does the NPS maintain the electronic sign that shows erroneous readings, such as what was highlighted in an LA Times story during the recent temperature spike? There are actually 3 temperatures, if you included the bogus 132F from the sign. It appears the reading comes from the non-official weather station mounted at just above roof level near the front wall of the visitor center. Is that the source? 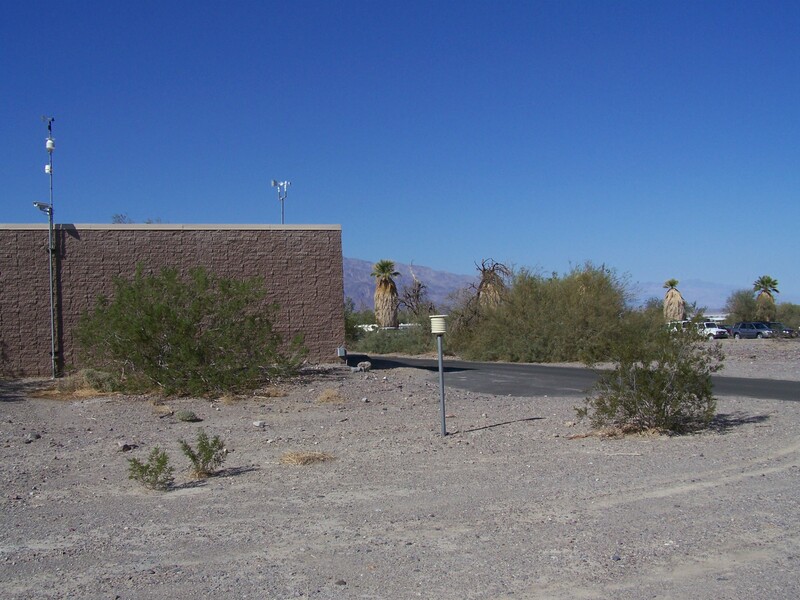 5. Who is responsible for the weather station at Badwater basin near the turn-off/parking area and where is the data from it collected? Is the data available? In your press release you indicate that the 1913 Greenland Ranch reading is “…the highest reliably recorded air temperature on Earth. “. If Badwater basin station were to exceed the 1913 reading, would it be considered reliably recorded? It seems to be near state of the art equipment. 6. How often is the mercury thermometer in the Stevenson Screen at NPS Visitor Center checked for calibration? From the photo recently posted by NPS showing the 128F reading, it appears to be well aged. What is the age of that thermometer? Has it ever been tested by NIST or similar entity? 7. Is there any sort of backup or reference thermometer in place inside the Stevenson Screen? 8. Do you have a location (lat/lon) for the 1913 location of the station in Greenland Ranch? What date was the Greenland Ranch station decommissioned, and were there other intermediate locations before the station resided behind the NPS visitor center? Thank you for your consideration. I look forward to the event. The black and white records seems to be created over time, a line added every day. The color one seems to be a manual copy of the black and white one, created probably within a single day. I’m guessing the “In Triplicate” on the bottom gives us a hint about what happened. Looks like the black/white version of the record is an old fashioned “carbon paper copy”. I suspect the original has remarks on it, because the carbons were sent elsewhere, while the original was updated. Just a guess though. REPLY: No that can’t be it. There are significant differences between the two, one is not a carbon of the other. For example “mean maximun” temperature is 116 on one form and 116.4 on another. There should be a third one as it says at the bottom in triplicate. I agree about the different handwriting (look at the 4’s) but the signature is the same name. The phrase “in triplicate’ (lower left corner) may explain some of this. Also why would the same person use fractional (i.e. 4/10) for rain on one form and decimal (i.e. 0.4) on another? When Mosher starts noticing differences in handwriting we need to verify what Dr. Gleick has been up to. Don’t expect to much from NPS. They had the nerve to house the Liberty Bell in a prefab rest stop-style pavilion for years. Mounting a temperature station on top of a roof or block wall is small compared to that organizational numbness. were blue ballpoints in use in 1913? Maybe the original log book in which it was written, was starting to become in such a poor state that they thought it would be wise to copy it into a new book. So as to save the data. “Hey, you guys must be so glad that you’ve not been affected by global warming for 100 years. Let’s hope that continues and you can celebrate again in 100 years. I guess I am kinda dumb because I do not understand the very foundation of celebrating the 100th anniversary of the warmest temperature ever recorded, and the warmists are the ones, apparently, most enthusiastic about it. Come on, let us look at the irony – it was hotter 100 years ago than it is today, and the AGWers get excited about this? Regardless, one thing is clear, if we just had experienced a hundred years of runaway warming, as the hockey stick indicates, that 1913 record would have almost certainly have been broken time and time again. But the 1913 record stands, and that makes we question the warmist data. And I look at the urban heat effect, the wholesale retirement of rural temperature stations, and a host of “adjustments” and data manipulations that always benefit the warmists, and I think, despite the fact that we are recovering from the Little Ice Age, there’s really not been much warming at all. There is a difference in the monthly record top one mean is 98.4 the second one is corrected(?) to 98.6. Also, it looks like were more than 10 degrees below the record even after 100yrs of warming, we may have to wait until 2113. 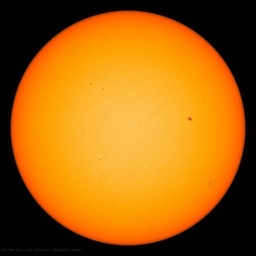 This should tell the logical ones amongst us that a new record here is neither here nor there in terms of AGW. Can you imagine the doomsday headlines if it had got to 135? Maybe this will lay the search for a new world record to rest as an indicator of anything. I’m a little suspicious of the 134F in light of the minimum temperature on the July 10th, 1913 being an unremarkable 85. Maybe it turned windy? The Black and White copy and the Color copy are two different temperature records, for statistical purposes. The 5th and 6th are clear on the B&W version and cloudy on the Color version. The 18th through the 23rd and the 26th are cloudy on the B&W version and clear on the Color version. The difference between “clear” and “cloudy” are two materially different observations that are not reconcilable. If this were any other type of scientific data, it would be appropriate to discard both as it is impossible to tell which is the correct one. The climate science approach to data handling would be to average the two and then claim a precision of 0.002°C per datum. There should be a third one around somewhere. The initials do not match the observer name. So this looks like a “copy” made at a later time, written in a different hand. The initials would indicate who actually created this form. This second version may actually have two sources. I would guess that there is a third document. Or put it this way> If I were given these texts and asked to reconstruct a history I would suggest looking for a third document. That third document ( maybe the B91 from a site nearby) could be the source of the differences between the original and the one in ink. ah I see rattus came to the same conclusion. Nearly posted an article on this a couple of times but what is the point? Open Goggle Earth. Go the the north south road by the station exactly due east of the Stevenson screen, into Street view and look due west. You will see the canopy over the parking lot or what it is today. Now use the normal aerial view checking the dated images. What is the black canopy? (visitor place is white roof, makes no sense) The edge of the canopy is visible to the screen. The white thing near the enclosure seems to have tarmac to it’s north. Lots of details need checking. As far as a site worthy of world record, no. I’m surprised at the lack of photographs, ought to be many over the years. Another oddity is the “blue ballpoint” on the “nice document”. While the ballpoint was invented in 1888, they were terrible until László Bíró imroved it to the basic ballpoint that we have today. First British patent for this improved ballpoint was 1938. If blue ballpoints were available, why was the “REMARKS” filled out with a fountain pen? I think Steve M’s post at 12:36 has the right of it. The color/blue one is a copy of the black and white. To my eyes I don’t see a difference in that points to a third as original source. Rather I suspect that if they needed 3 copies and these were kept in books, that there was a first copy book (source) and 2 more were drawn from that. I know some have said that in one the whole month is clear and in the other there are cloudy days, but I see a match of the word cloud on both. >shrugg< A puzzel perhaps, but nothing nefarious going on here. This is really thread jacking in a way, but being one who worked extensively with multi-part field survey forms (field copy, office copy, file copy, etc) – the blue looks like carbon paper with PENCIL markings highlighting certain items with fountain pen notes and some shorthand. The black and white one looks like an office scribed version with things written out in full and may have been filled out by an assistant then signed by the originator after checking the transcription. Pretty common in the days before copiers and computers. Jeez, I hate revealing all that old technology. What’s worse, I still have a package of blue carbon paper in my computer room. Yes it does look like the copy (the one in blue ink) has had information added to at a later date. Which has been written in black ink. When we were doing paper copies and there was an aircraft accident nearby, we would confiscate the original and recopy. They may also have been doing it in triplicate. They may also have been doing quality control and some readings may be corrected. I do not know how they do it now. In Canada the number of errors observers made was noted (before computer error) and they heard about it good or bad. I didnt read anything folks wrote about this. Just looked at the documents and note what I see. i wouldnt speculate about the purpose. first determine whatever facts we can. they dont look contempraneous (ink) . they arent written in the same hand. there are differences. That points toward but does not confirm the existence of a third document or other source. why it was made? person who initialled it might know. Anthony, I think it is very significant, with the success of WUWT, that a government agency cannot answer your most serious and relevant questions. I bet the little fanfare occurred originally because the station was young enough such that no one had a clue what sort of range an ‘all-time record’ high might even be out there. After all, it was about 20 years before continual measurements started in Vegas. The two records were not written by the same hand, that is obvious. I’ve read surveyors notations that date back ~100 years, everyone has a style. The draftsmen like to add their own “flourish” to the end product. Don’t know why some of the numbers would change ?? The blue ink copy was obviously made later than the original which is in black, and might be pencil rather than ink (I’d use a pencil on a document kept in any place where it could get wet). Note that the person making the copy signed for O.A. Denton, but initialed the document. The black ink additions regarding RH to the copy look like they were done with a drawing pen that was dipped in a well. They write a broad stroke at first as the excess ink flows off. Why this different ink? Who knows? Probably that RH data was found at some subsequent time and merged into this copy and the original blue ink pen was not available. Note the black RH values are from a different writer than the blue–different lower case ‘r’ at the termination of a word. The blue ink might have come a good quality fountain pen, not a ball point. The ink looks like it bled, which ball point ink does, but maybe this is an artifact of the JPEG? There is a second, lighter color of blue which I thought was an attempt to get a dried nib to start writing by using a dip in water. However, on second look, the lighter blue actually looks like pencil. Then there is the underlining which is definitely pencil. Lot’s of people have played with the copy. It’s interesting to speculate about these copies of the document and its copy, but they don’t seem much out of the ordinary. The originals would be better to inspect. The original has messy penmanship, and I wonder if there are some transcription errors as a result–note the ‘2’ in places that almost looks like the writer started a ‘3’ and corrected himself. The more amazing thing is that Death Valley had more precipitation in July 1913 than we are likely to get here in Cheyenne this July. Oh, it’s parched here. … why are there two different paper records? You got to love the trolls. When they have nothing meaningful to contribute, they still contribute in rambling circles of meaningless babble. The 2nd is a forgery. Just look at the “July” in each document. You will find that the J in the 2nd is more upright causing the whole word to slant differently. The signatures are not the same. Look at the crossing of the “T”. In the 2nd its way too long and imprinted harder. The length of the entire signature is too long. The “O” and the “A” first names are completely different. The California’s are different besides one being shortened, so carbon copy theory is wrong. That’s just a few examples. But how old would need some analysis of the ink used. Hmmmmm…why do it? For what reason? Worked on a weir once upon a time and after logging the counts for the day went and made my dinner. In the meantime, a huge wind came up and blew the log book into the river! In a panic, I got an empty log book and tossed it into the river. I followed it in a boat and it went to the exact same spot under a log jam several hundred yards downstream. Whew! I told my supervisor about it the next day and he said no worries cause he had a duplicate in safe keeping. Perhaps that is what the additional “copy” is with the differences being rounding up of 100ths? Maybe he was keeping a backup for his own safe keeping in case someone lost the original? So why not set an example and use some punctuation and capitalization? You are misinformed with respect to the English major part, I think. He is just playing out the hand. As to why they made a copy. They could be a big clue in the photocopy of the original. Notice the black line that runs from the little group of numbers in the middle of the page to the right hand bottom of the page. Notice how on each side of this line that the lines on the pages do not match up. This would suggest the this line is in fact a tear in the page. So if this was the case, then they would of had a very good reason for making a copy and so save the original from further damage. Should have wrote “that” not “the”. The real story here is that the 100 year record has not been broken. It is that fact that should be hailed. Everything else is just an aside. Who you calling a troll, geran? I’m a regular here; you don’t like colorful commentary on the murky state of climate science and ‘funny’ supporting docs (nothing seems to be simple, straight forward or ‘clean’ in the documentation regarding ‘climate’)? Makes you wonder if this “celebration” of the past high temperature record is to set the scene in the minds of potential voters, for the pea and thimble switch hope for a hotter temperature to be recorded at the other set up Death Valley location, i.e. framing the framing of the debate !!! or are we now too well informed to fall for that? Perhaps the black and white was the original used to make each day’s entry and the other a neater copy that was actually turned in at the end of the month? Or the neater one made in the main office with remarks added from a separate record? Geran, you leave me vexed, can’t tell where you are coming from. Both are carbon copies; both are smudged and the lines are blurred. Neither are originals. No reason to assume that both originals were not filled out in triplicate … but obviously, at least in duplicate. So there are 2 originals that we haven’t seen, and probably 1 or 2 carbon copies that we haven’t seen either. After multiple copies were made, they were separated and went to different desks where other notations would be added … as in the Remarks section of the ‘blue’ copy. Wayne Delbeke @1:25pm … I’m liking your reason for the two versions. That just sounds like how things would have been done, back then. Not that different from when I first started clerking in an office a few years before we finally got computers! Don’t know if I added anything to the conversation, but what do you want for 2 cents? I have postcards from Germany written in Indelible pencil dated 1905, that are very clear to read. This may authenticate the 1913 date somewhat. These may be temporary urls. I accessed them by going to http://www7.ncdc.noaa.gov/IPS/coop/coop.html and searching for Greenland Ranch under California. 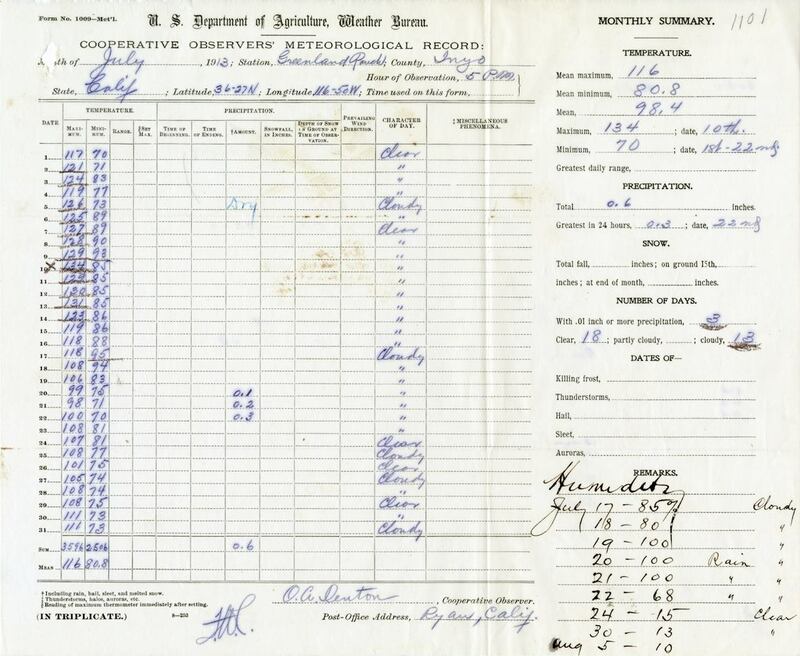 The first one is a U.S. Department of Commerce, Weather Bureau, Climatological Observer’s Meteorological Record for July 1913 on WB Form 1009 (?). The second appears to be a better copy of the “black and white” version in the main post with a cleaned up copy attached as page 2. My original comparison was in error. Following are (hopefully) correct comparisons between the versions. “Color” refers to the first one in the post with blue lettering. B&W refers to the second form in the main post. WB1009 is the U.S. Department of Commerce form, instead of the U.S. Department of Agriculture form. The fourth form has identical, but more legible information, to the B&W so I omit any direct reference, but I got the numbers from the better quality version. It looks like the Weather Bureau Form 1009 may have been the original version. The B&W may also be original, but for the Dept. of Agriculture. The “Color” version looks like something that may have been created after the original with some of the temperature data edited. I don’t think any of these, however, is the original, official version of the temperature record, based on something I found elsewhere. NOAA has a page dedicated to George Washington Carver. 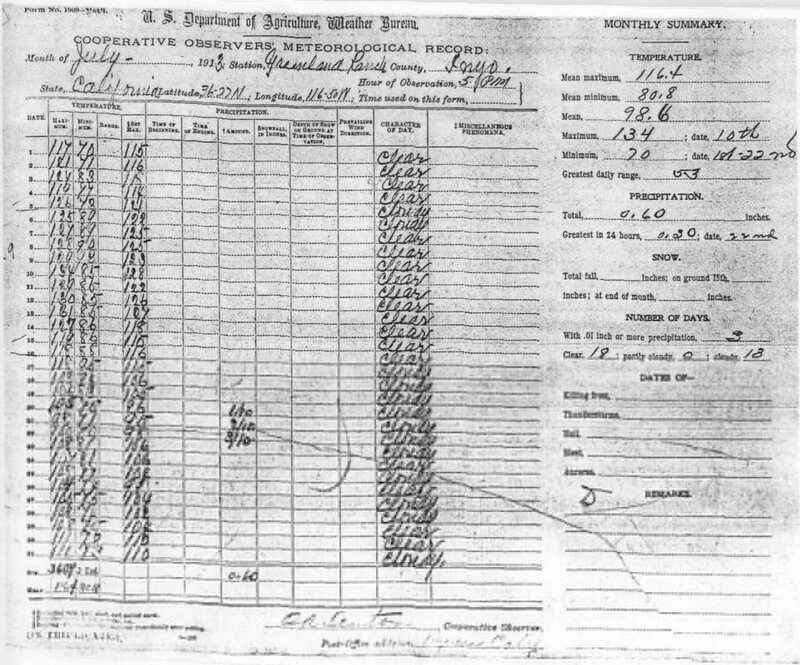 If you look at the weather data that he submitted on observations made at the Tuskegee Institute, the forms are stamped with the date received and were reviewed, mean temperatures calculated, and observations made, often in red ink. Sometimes, individual datums were changed, usually with little to no explanation of why temperature values were changed, sometimes by as much as 20 degrees. The first observation by Carver was for November 1999 and was examined by G. Gardiner (?). Feb of 1910 has large adjustments made in red ink. Dec of 1945 was also edited by there is no indication by whom. Nov of 1950 also shows some temperature datum adjustments. Where are the forms for Death Valley (Greenland Ranch), CA for July of 1913 that have the file stamps showing when they were received and the names, initials and/or notes of the reviewers? I suspect that the difference between the various versions was due to just such a review and the adjusted/corrected values ended up on the “color” copy, which was created after the reviews, maybe because it was recognized as a record high temperature and somebody may have wanted to create a clean copy, but who knows? Special care should be exercised in the preparation of reports; pencils should be kept sharp, and good carbon paper used to insure satisfactory duplicate copies. Three copies of the report should be made, one to be retained by the observer and two to be sent to the section center on the first of each month. As a side note to Anthony, somebody has been very diligently trying to create a weather observation history (including lots of great pictures of actual locations of stevenson screens) for a number of stations here. On the color copy one might note the notation at the bottom. “In Triplicate” means that 3 copies were submitted. Considering the amount of money pouring into the issue from the fossil fuel industry, my bet is both copies are forgeries planted via the use of time machines financed by Exxon. The current unprecedented warmth being again confirmed by Mann’s hockey stick graphs, of course. Because the copies were made by hand? Probably for nothing (in this case). When the government surveyors went out to survey “the west” of the Ohio River, they kept notes. The notes were brought back to the office, drafted into a map, which was approved by the Surveyor General. 6×6 mile townships, that would later be divided into 1×1 mile sections, divided again as needed or as sold/ acquired by settlers. So, mid-1800’s you go due west, on a compass bearing setting a marker at every mile. Then due north (up and down hills, cut a path thru that forest, work thru that swamp). Yes, the east-west lines are a curve, of latitude. (you’ve got the North star). Corrections are made every 24 miles. After working in government for 26 years, this is no mystery. When you need to fill out a form in multiple copies, the easiest way is to do it once by carbon paper or NCR paper if you’ve got to do it without a copier or printer. However, sometimes there’s no carbon paper around or you need to send an extra copy somewhere, so what do you do? You re-copy by hand. Depending on where it’s going, you don’t need to fill out everything, just the relevant parts. So, basically, they end up getting filed in two different places and decades later, don’t perfectly match, because nobody ever figured a routine document would ever be looked at again. Hint, in English language, copies in duplicate or triplicate don’t mean that the documents can have different readings or notations. They need to be identical. So much for English majors. It would be helpful to know what the bureau procedures were for submitting forms back in 1913. After looking at the two images, one layered over the other, it does look like the handwriting was from the same person. The difference might be that the black and white version was done day by day and the blue version was done as a cleaned up copy for end of the month paperwork to be sent into some central office. The blue copy does look like carbon paper and it is in a slightly neater hand. That would explain the hash marks in the cloudy/clear column rather than spending more time writing the same two words over and over down the column. It’s also possible that the decimals were required for the submitted form to be sent off to a main office. The day by day would be written in the standard fractions that the writer was comfortable with. As I said, it would be helpful to know what the regs were back then for form submission. I think that carbon paper 100 years ago did not have the precision of todays carbon paper and rounded off the decimals. Maybe Mr. Denton was dislexic? Or the person copying it? Or it was so darn hot he’d gone nuts? The only way to escape heat like that is in a mine, cave or underground dwelling. No AC back then. “It would be helpful to know what the bureau procedures were for submitting forms back in 1913.” Deb Wise. I couple of points. Ball point pens didn’t come into general use until the 1950s. When I went to grammar school in California in the 1940s, every desk had an inkwell with ink in it. Let me assure you that no sane teacher would give a third grader a bowl of ink if there were a viable alternative. Carbon paper might have been available in 1913, but it would only have been used with typed or pencil written material — not being all that useful for fountain pens. In general, the hateful stuff was used for typed material because of smudging from hands/wrists resting on the paper while writing higher up the page. Office copiers didn’t come into wide use until the 1960s. If two copies of something were required in 1913, the copy would surely have been made by hand. I think we are probably looking at the original and a hand generated official copy. Why make a copy? Possibly because the original was kept on site, and a copy was kept in Washington? But there could be other reasons. There are probably folks still around who worked around weather stations during or prior to WWII. Probably should ask them how the data was handled. Two words: “Evaporative cooler”. A natural for a hot, dry clime like Death Valley. Widely used as early as 1385 in Iran. Apparently not when it comes to actually communicating. You know, with proper punctuation, grammar, etc. The blue copy has an additional signature. My bet is the black one is the original; the blue one is a cleaned up copy; and the extra signature to the left and below the normal signature line is that of the copier. What doesn’t fit though are the humidity readings added in yhe blue copy. Where did they come from? _Jim Two words: “Evaporative cooler”. A natural for a hot, dry clime like Death Valley. Widely used as early as 1385 in Iran. Certainly possible. But my guess would be at the Furnace Creek oasis in 1913, the buildings were probably built of locally available materials — e.g. adobe bricks albeit maybe with a wood roof. They’d have had to haul the wood for a frame building a long way using horses or mules. Not all that cool when temps are that high, but probably 20-30 degrees F cooler than the ambient air. Having encountered 120F air temps in my youth in the upper Salinas Valley, I recall indoor temps as being unpleasant whereas outside temps were simply brutal. of Visitor’s Center high was only 117.
rain at couple upper deserts stations. Except, of course, the only days with maximum temperatures less than 100 degrees was when it rained. Heat of evaporation/humidity in the air, are not accounted for in the official global records.